Now I understand what you are trying to accomplish. Haven't held a SS since last season.....is the binding adjustable? I'm wondering if the position of the binding has you too far forward putting to much pressure on the tips of the skis? If the binding were adjustable, maybe moving it back 10-15mm might help. I know on some bindings, you can take them apart and "cheat" them back a couple of clicks. ALso, I was curious to the answer to a question Ron asked....What year SS are they? The reason I ask is that a Head rep told me when they first year model came out, they were softer flex then the following years. Gary, the bindings are not adjustable. The plate is predrilled and it may be possible to mount the binding in a different position? I actually own both a pair of brand new 2006 SS's (the first year made) and a pair of 2007's which I skied on yesterday. Buck, do both skis feel the same on snow? I thought the first season? was 04/05. If 2006 was the first season..is what the Head rep told me true that they were softer flex? He said they made solid improvements to the ski the next year marketed. Check to see if somehow the adjustment can be cheated back on the binding. Bindings adjust to an indivuals boot sole. The installer aligns the center mark of the ski to the mark on on the side of the boot. If you could not set it to the center mark but drop it back 5-10mm.? If you're not comfortable with this....check with? someone you trust that can help. I have done this on my own bindings where I needed to move it forward and it worked fine. Even a few mm may make the difference in how the ski handles for you. Ron, not familar with? the Head ff bindings.. OK....pre-drilled....there is a factory setting, understood. Still, I believe there may be way to adjust as stated above. Gary as far as I know last year was the first year of the Supershape. I never skied my 05/06 pair of SS's, their brand new and for sale. I was told they are the same other than graphics, flexing them they feel about the same. The Free Flex bindings are mounted right on the boot sole center mark. The ski is maybe just to soft for my size, the 175cm would have been a better choice. Gary:? Buck is correct, 05/06 was the first year for the SuperShapes.? What you are remembering is that there was a big difference between the skis that were available to the spring testers in spring of 05 and what was delivered for retail sale for the 05/06 ski season.? Head stiffened the ski (especially the shovel) quite a bit, and I believe that people were also skiing it too short.? Peter tested it at 160 (all that Head provided for spring testing? 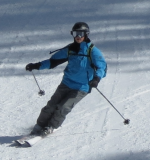 ), but most people in the 180-200 lb range wound up skiing it at 170 (once the characteristics were known).? I would agree with you that at 215 and on the SuperShape, Buck should be on a longer ski.? Actually, for the speeds he describes and his skiing style and ability, he should be skiing the i.SL (non-chip) instead of the SuperShape. Thanks Jim...I knew that something had occured with the first production SS on the market. I agree, the 175 could be a much better fit for what he is describing. Still, I've got to believe something could be done with the 170's and I'm going to ask around. Definitely should be looking at the isl but how about the Nordica Speedmachine III or the Head supershape SPEED, this is a had corp race ski. he may even want to look at the Atomic Superspeed. At 70mm it mat be a good alternative. The probelm here is that once you go wider, you start to get softer, its inherant to the design. Thats where the 82 may be good for him, its very stiff for a mid and with the vert walls, its may be the ticket- BUT it won't have the same performance of a race ski. I only mentioned the i.SL as a way of saying that Buck should consider real slalom skis and not rec. slalom based on what he was describing as his ski style. Since he was looking for a Head quiver, I only mentioned that one ski. SuperShape Speed. My understanding is that this is pretty much the same as the old (but excellent) Head i.Race. it's more of a GS ski than a slalom cut, and it sounded like he was happy with the 1200's for a long radius zoomer. I have a pair of Supershape Speeds in 177, great longer radius GS type ski. I wanted a physically shorter, tighter turning, easy, more forgiving and versatile ski for playing around on smaller hills with my 5 year old that could still rip it up on occasion. Most of my ski's are longer in length and radius, I wanted something different with the Supershape. I haven't given up on it yet, I've really only been out the one day and I was wearing new boots. Hey Buck, shorter skis react quicker to skiers input. I know you said stability was a problem with the SS 170's. Try this on a green slope with those 170's on: Pick up stationary as a object as a focus point downhill (remember, green slope)now lift one ski off the snow, aim towards that fixed object and see how you track. Do not try and move your body around to stay straight. Just go where the ski takes you. Do the same with both feet. If you track straight, that eliminates alignment issues. If you pull to the inside or outside, it demonstrates the inablity to get those skis flat. These issues would not show up as readily with longer or wider skis. With shorter skis, it's going to be much more difficult to track straight if you are out of alignment. Hi Gary, I do have alignment problems but have corrected them as much as possible with extensive boot sole canting and custom foot beds. I wanted a ski with a little more side cut to spice up our boring little midwestern slopes, its maybe a hair more than I wanted. I need to keep in mind it's not a GS race ski, my expectations were maybe a little high. I was actually looking for a more relaxing ski for playing around on smaller hills under various conditions with my 5 year old. I have not skied this ski in the element that it was purchased for, only on a hard GS course minus the gates. I believe the ski is short for my weight and aggressive skiing but I haven't given up on it yet! you'll learn to love them or leave um....time will tell.